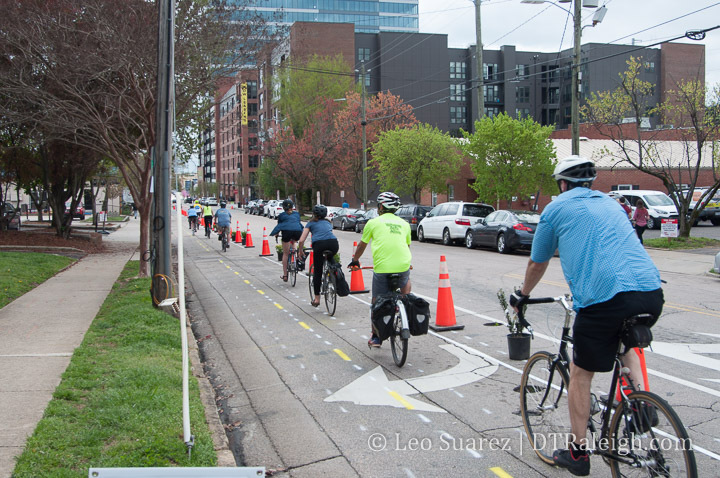 This past weekend, Oaks and Spokes, Raleigh’s loudest and most organized voice for bicycling in Raleigh, set up a cycle track demo for a section of Harrington Street. As a huge supporter, I hung out, volunteered, and just absorbed the street with this temporary cycle track in place. Having only seen cycle tracks in other cities but never actually ridden through one, it was a pleasure to ride through it in my own city. After giving it some thought, here’s what I took away from this weekend’s demo. When you compare the suburbs with downtown, one major difference is the mobility scale of each environment. Historically, downtowns that pre-date the car were built at a more human-scale with things closer together while suburban areas planned around cars are more spread out. In downtown, walking, a human-scale form of mobility, is well accommodated with sidewalks on both sides of the street and no real “direction.” There is no such thing as a northbound sidewalk for example where as Wilmington Street is a one-way street for cars heading north. Wilmington is an example of a road designed for car-scale mobility. This was fine for awhile but with a street culture obsessed with markings and direction today, when we make space for human-scale things (i.e. bicycles and scooters) they don’t work when the scale is actually intended for cars. We should strive to make all street space two-way for bicycles, scooters, etc. 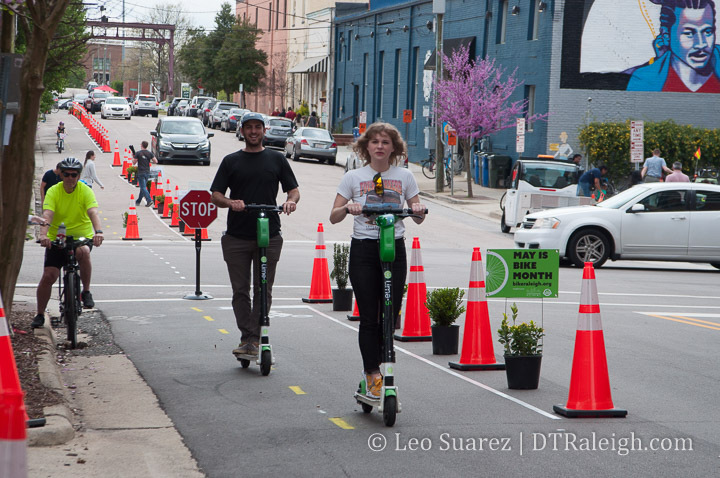 in order to make on-street, human-scale movement more intuitive and natural. This probably explains some of the “bad behavior” we have seen with scooters recently because it takes too long to circle the block if the final destination is closer when going up a one-way street. Consider me an advocate now for having every single downtown street converted to two-way for bicycles alongside existing car traffic flows. Similar to the above point, I want to reiterate a solid point that the cycle track gives users above painted bike lanes. Physical separation is the key point here and should be required in future installs. It’s in plain sight yet few seem to notice that when we drive a car, the car itself is wrapping us with safety features and physical protections. At the human-scale, as a walker or cyclist, those features don’t exist and we rely on our physical environment for safety. This is true in other areas as well outside of transportation. I think most obvious is with outdoor seating. Outdoor seating is more popular along sidewalks with on-street parking versus active travel lanes. The cars act as a barrier and makes it more comfortable to sit. 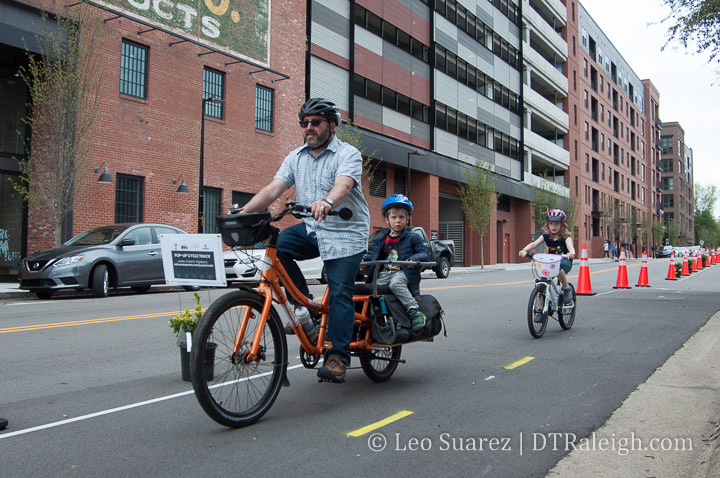 We need to familiarize ourselves with a variety of ways we can physically separate our human-scale mobility options away from the car-scale options. As publicly-owned space, our curb areas and how we are using that space is being brought into the conversation. Alongside plans for future cycle tracks and other new street space like dedicated bus lanes, we need to understand how to make this limited space more productive. This means objectively challenging the thought that removing on-street parking will be a detriment to nearby businesses. New parking decks are popping up around downtown Raleigh so their use in addition to the loss of the few spaces per block needs to be looked at. Loading zones also need to be looked at as the streets also need to be a transportation network for our downtown businesses. Are their operating hours set correctly? Can these be consolidated? I do think it doesn’t necessarily mean that a cycle track gets 24-hour access to the space either. Allowing deliveries to be made inside a cycle track between certain hours may be appropriate. Delivery persons may have to put cones out to redirect riders into the street, as just an idea. The Cycling Community is Alive in Raleigh! This past weekend, I met folks who knew about the project and all the work that was going into it as well as those who just came out of curiosity. Others just stumbled on the project and had positive things to say. Advocacy was strong and the community stepped up to support. 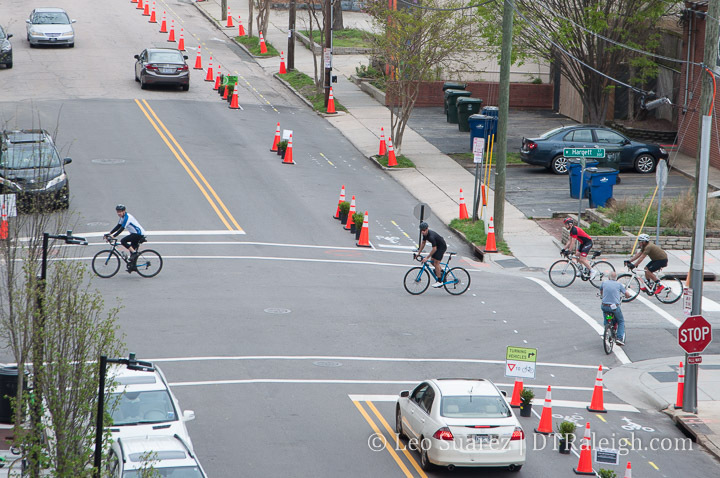 I feel like a real community has been built in Raleigh around cycling and the longer we don’t serve that community, the louder and louder it’ll get. Again, a lot of credit and thanks goes to those behind Oaks and Spokes so if this is something that interests you, reach out and help.